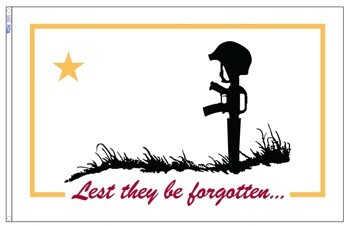 3 ft x 5 ft Flag for the Fallen. 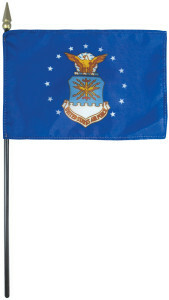 Outdoor 200-denier nylon flag with white canvas heading and two brass grommets. Made in the U.S.A. by Valley Forge Flag Co.
4″ x 6″ U.S. Air Force mini-flag on 10″ black plastic staff with gilt spear tip. Silk-like polyester with digital print. Made in the U.S.A.
Click here for other stands and desktop flag sets. 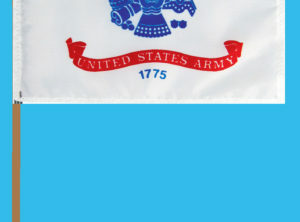 8 in x 15 in Service Banner with 1 to 3 blue stars to indicate number of relatives in military service or 1 gold star (for deceased). Printed on glossy satin-like polyester. Yellow-gold fringe, wooden crossbar with spear tips and yellow-gold hanging cord. Made in the USA. Select number and color of stars from the menu. Hemmed printed cotton U.S. flag stapled to a natural wood staff with gilt spear tip. Made in the U.S.A.
Scroll down for summary of prices. 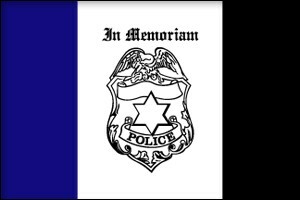 3 ft x 5 ft Police Mourning outdoor nylon flag with canvas header and two brass grommets. 3′ x 4′ Navy Retired flag. 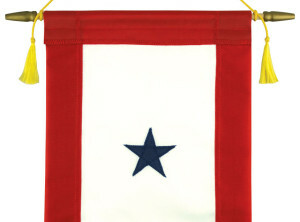 Outdoor 200-denier nylon flag with white canvas heading and two brass grommets. Made in the U.S.A. by Annin Flagmakers. 12″ x 18″ Army flag stapled to a 30″ x 3/8″ diameter natural wood staff with gilt spear tip. 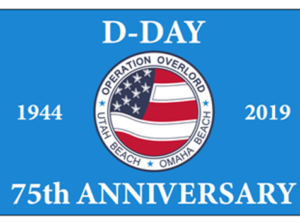 Made in the U.S.A.
3 ft x 5 ft “75th Anniversary D-Day” all-weather Nylon flag with canvas heading and two brass grommets. This year is the 75th Anniversary of the D-Day invasion. This 3 ft x 5 ft flag will make a great reminder of that defining battle of WW2. This is a thoughtful gift to a serviceman or their family. This flag should also be flown off of every Veterans organization’s flagpole. Be part of history with this 75th Anniversary Flag. A great gift for any WW2 veterans, their families, and history enthusiasts.